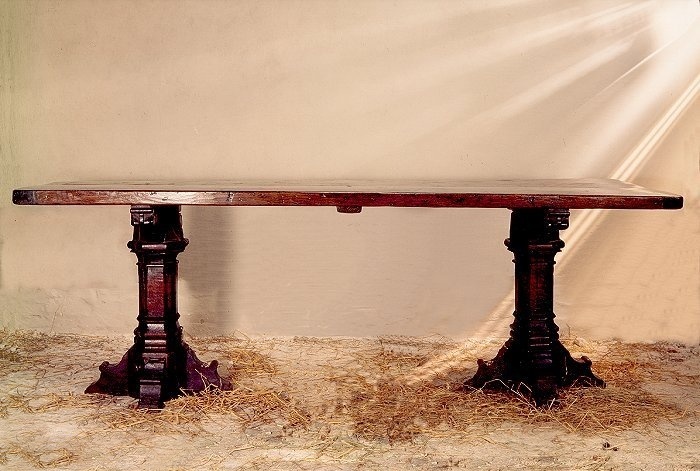 REPLICA MEDIEVAL TRESTLE TABLE handmade from ancient oak and styled around the latter half of the 13th Century. The great halls of larger houses built between the twelfth and fifteenth century served as communal areas for feasting and entertainment. It was common practice for diners to be seated on long benches or stools on one side only, facing into the room, where they could be served easily from the other side of the table. This is likely to be one of the reasons why early tables are characteristically narrower. In order to provide more room in the hall for other purposes, tables could often be dismantled and stored to one side. One way of achieving this is to employ a pair of free- standing pillars, with cruciform feet for stability, which support the detachable top, at each end. These pillars could either be left completely plain or be the subject of lavish decoration. An attractive means of decoration was to hand cut a series of ornate mouldings into an octagonal cross section. This practice can often be seen today on the crown posts of important medieval roof structures. More pictures of the Medieval table.